The deterioration of the Nordic states’ immediate security environment after the Ukraine crisis has given a new sense of relevance to Nordic foreign and security policy cooperation. The focus of the cooperation has shifted to issues of regional security, with the Nordic states exchanging views on and information about developments in the Nordic-Baltic region. 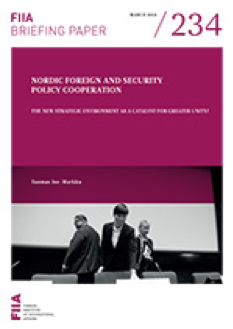 Despite increasing interest, the Nordic states’ levels of commitment to Nordic foreign and security policy cooperation and their preferences regarding its future vary. Moreover, Nordic foreign and security policy cooperation continues to be characterised by informality, fragmentation and a lack of clear political guidance.